Most of the districts of Lisbon, Belem, Baixa and Chiado included, boast of rich historical backgrounds at present materialized in the huge architectural patrimony each of them proudly display to the eye of the wandering traveler. 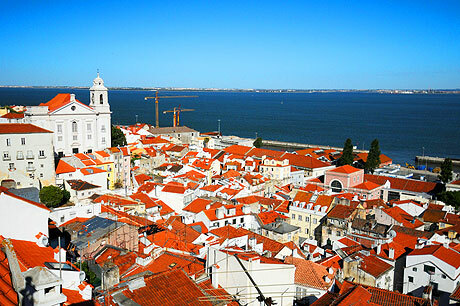 However, Alfama is, by far, the oldest of all districts in the capital of Portugal. It has kept a strong medieval atmosphere, mostly due to the fact the 1755 earthquake had no impact on the area (given the solid dense rock foundation of the district). The district is, in fact, the core starting from which the rest of the city later developed. It was inhabited by the Romans (as the Roman Theater Museum proves it) and by the Visigoths, but it were the Moors who left the most consistent heritage to Alfama, its name included (Alfama derives from Al-hamma, which means baths or fountains, from the springs which used to crisscross the area). The layout of Alfama, with its meandering streets covered with cobble stone, small squares and whitewashed houses, is the unmistakable heritage of the Moors. But what is striking about Alfama is that on top of the specific individual attractions, it fascinates by its overall vibe: wrought iron balconies and flower pots decorate the houses, whereas the narrow streets lead tourists to some of the most unexpected sights they can stumble across in Lisbon. Thus, the Alfama maze is dotted with major objectives, such as the said Roman Theater Museum, the Fado Museum, the unique Tile Museum, and the Museum of Portuguese Decorative Arts. In terms of religious edifices, tourists may direct their attention to the National Pantheon (or Church of Santa Engracia), to the Lisbon Cathedral and to the Church of Saint Anthony (and to the small adjoining Saint Anthony Museum), as well as to the Monastery of Sao Vicente de Fora. Casa dos Bicos and the Castle of Saint George can also complement the sightseeing tour of Alfama. Visiting the fado houses which have recently started to become increasingly numerous in Alfama is yet another excellent idea to spend time in Alfama, given the said fado houses provide tourists with some of the best and most unique entertaining moments in Lisbon (fado is a specific traditional Portuguese type of music largely popular in Lisbon and in the surrounding areas). The bottom line is Alfama is, just like Belem or Baixa, a major tourist hotspot of Lisbon, an area not to be overlooked by visitors who want to sample what is most intimately and essentially specific to the local charm of the capital of Portugal.